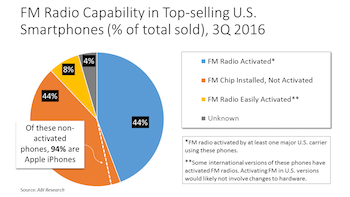 A new study from the National Association of Broadcasters’ PILOT program found that among the top-selling smartphones in the U.S., the FM chip is activated by at least one major carrier in 44% of them. The chip is installed but not activated in another 44%, and nearly all of those are Apple iPhones. By Pilot’s metrics, “top-selling” includes the upper 70% of U.S. sales, so this assessment covers roughly 20 of the most common phone types. NAB has been pushing for the activation of FM chips, which can be found in most smartphone models, for years. Pilot has tracked activation rates since 2012. NAB also runs the website freeradioonmyphone.com, an advocacy group including NPR, APM (American Public Media), and NextRadio which gathers information and statistics about the push for making FM radio available on smartphones. NextRadio is part of all this, of course, as its app provides an enhanced FM tuner for phones with activated FM chips.